When my friend Pat's horse hit his head on the top of his dutch door, she called me and we discussed his post-trauma symptoms. He had a non-bloody nasal discharge but was otherwise alert and seeking comfort from the humans around him. She called the vet, who looked him over and confirmed that permanent damage was unlikely. But he had this big bump on his head! While I googled head trauma, Pat did her own research of medical literature and identified her horse's condition: suturitis, or inflammation of the naso-frontal suture. You see a picture of this condition on the left. Pat's horse had no symptoms to indicate serious injury, but she called the vet anyway. But there are times when an immediate call to the vet could save a horse's life. Sometimes the horse will black out momentarily and remain standing; other times they may fall down. Any time the horse loses consciousness a vet should be called. A vet might prescribe anti-inflammatories, anti-seizure drugs, antioxidants and diuretics. If the horse does not improve in 24 hours, the outlook is grave. If they recover in 6-8 hours they will likely live, but initial improvements may reverse themselves after a few months. Loss of coordination, walking in circles, and head tilt can indicate middle ear damage. Along with treatment, the horse should be kept outside to aid in recovery. Horses that don't improve in a few days have a poor prognosis for athletic work. There is a nerve that runs down the side of the head, and it controls the muscles of expression in the head and face. When it's damaged, horses will exhibit drooping lips and nostrils, facial palsy and the inability to blink or close the eye.Facial nerve injuries will gradually regain function, but it may take 3-6 months or longer. Some horses do not improve. In the above two situations, it goes without saying that owners should be very careful in handling their animals. When large animals are not in control of their bodies, they are a danger to everyone around them. Blindness. Hold your finger about 8 inches from their eye and it back and forth. Does the horse track the movement? Another consideration is that depending on the type of accident, the horse may have other injuries affecting movement. In the case of a horse flipping over, a fractured wither is a possibility. 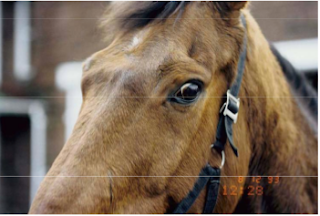 The good news is, the survival rate in horses with head trauma is better than originally thought -- about 62% survival rate for 34 cases presented/treated at the UC Davis vet clinic between 1994 and 2004. The worst prognosis is for injury to the base of the skull and horses that are recumbant (down) for more than four hours. In the latter case, the down horse is 18 times less likely to survive. This is a Wow article -- thorough, detailed, and probably the one article to read if you're only going to read one article. Kudos to Equus. Oh wow, we have a horse that has the same lump as the one in the picture. His has decreased in size over the past year but is still big and noticeable. Has the horse in the picture's gotten any better with time? Every time I think of head injuries, I think of Smarty Jones and his accident in the gate. Fast action and a super good vet saved his life and now he is proving to be an exceptional sire. One of those success stories we need to hear. My horse, Annie, received head trauma from trailer loading on the day I bought her. She reared up and the lead rope broke causing her to hit her head on the trailer before she fell over backwards. For three days she hung her head, wouldn't eat, and bled from her nostril. She fully recovered except for an enlarged forehead. It looks a little like the jibbah that Arabians have, except that it's not quite centered. I guess we were very lucky that she fully recovered. Want to know a quickie ER nursing trick that I have used with horses also?? If a horse bangs his head and results in blood coming from the nose (in my case a pony was kicked in the head by a big old warmblood. . .also a weanling who hit his head in a scramble to find mom) I dabbed the pony's bloody nose with a gauze pad/ 4x4 and then set it down flat. It is called a "halo sign" if there is cerebral-spinal fluid in the blood (ie "big 'ol problem)there will be a wick-ing action and there will be a straw/pale yellow ring around the blood.